27 years, 2 months, 15 days old age. Mitchell Santner will turn 28 on 05 February, 2020. Only 9 months, 15 days, 21 hours, 26 minutes has left for his next birthday. Mitchell Santner has celebrated the total number of 27 birthdays till date. See the analysis by days count and bar graph. 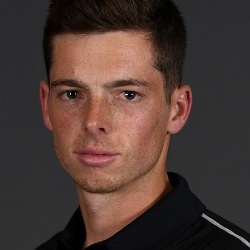 Mitchell Santner was born on 05-02-1992 in Hamilton, Waikato, New Zealand. He is a New Zealand Cricket Player. Mitchell Santner got the opportunity to represent New Zealand after Daniel Vettori decided to hang his boots. He is arguably a like-for-like replacement of the legendary spinner. He was finally sent on the tour to England to play a couple of warm-up games because some of the senior New Zealand players were absent as they were busy with their IPL commitments. In the first practice game, he not only impressed everyone with his balling but with the bat as well. He scored 27 and 94 respectively. He was thus inducted in the test squad but only to warm the bench as he didn’t get a single opportunity. He though was included in the One Day team and played in all five matches. He scored 97 runs and also picked 7 wickets with the ball in hand. He did had an impressive debut series but failed to keep up to the promise. He had his share of injuries as well. He has played for NZ but only in bits and pieces as Ish Sodhi and Todd Astle have made his inclusion tough. He was roped in by CSK for the 11th edition of the IPL. He though missed the whole season due to injury. He was seen as the next big thing in NZ cricket after Daniel Vettori but he has thus far failed to live up to that expectation. He was born to Josef Santner.He has a brother named Elliot Santner and a sister named Olivia Santner. He is in a relationship with Caitlin Podunski. He made his first-class cricket debut in the year 2011. He loves pets and owns a cat and a dog. He was looked upon as a like-to-like replacement of Daniel Vettori.